The only way to guarantee that you are “eating clean”… is to make it yourself! No more feeling guilty about eating packaged, preserved, nasty products- homemade is the way to go! These taste WAY BETTER than store-bought protein bars, can be grabbed on the go, and last in the fridge! AND you know they are healthy since you are making them! I bet these will become a weekly tradition for you (especially if you meal prep) and it definitely satisfied my sweet tooth! 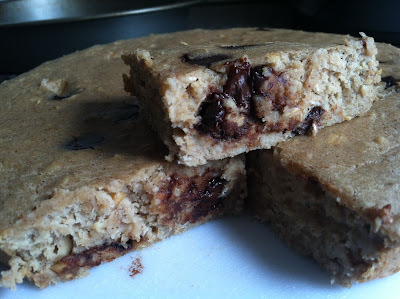 I've wanted to experiment making protein bars for the longest time.. Well, this one is checked off the blog-bucket-list and I hope you enjoy them as much as I do! -Preheat your oven to 350 degrees. Coat a pan with olive oil cooking spray. I used a 9" circular pan, I'm sure an 8x8 or other size would work just fine- you just may need to alter your baking time by a few minutes. -Mash your bananas in a large bowl. I used a handheld mixer. -Lastly, stir in the dark chocolate chips! Pour your batter into the greased pan and pop it into the oven (at 350 degrees) for 20 minutes! The middle should appear solid, almost as if you were baking a cake. 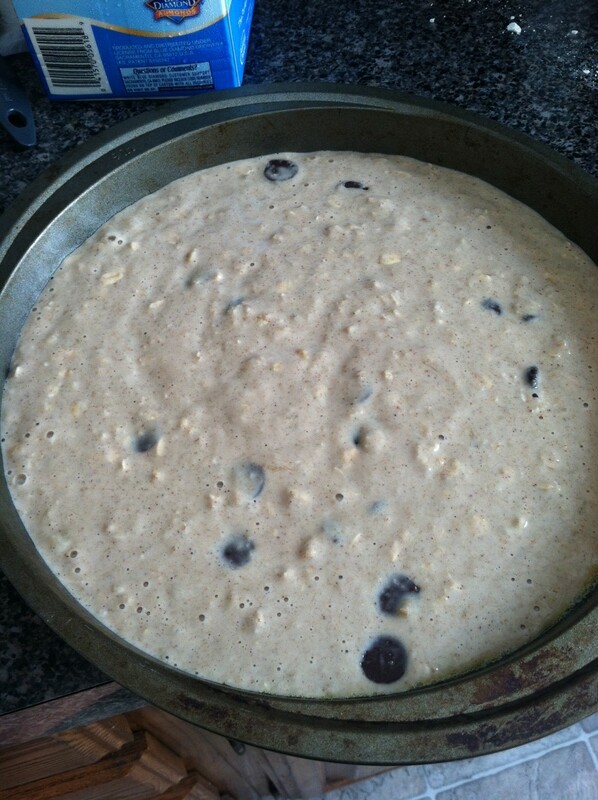 Let it cool for a good 10-15 minutes. Next, I was able to flip my pan over and the bars came out easily and cleanly out of the pan! (Remember to coat the pan with cooking spray before pouring your batter in). 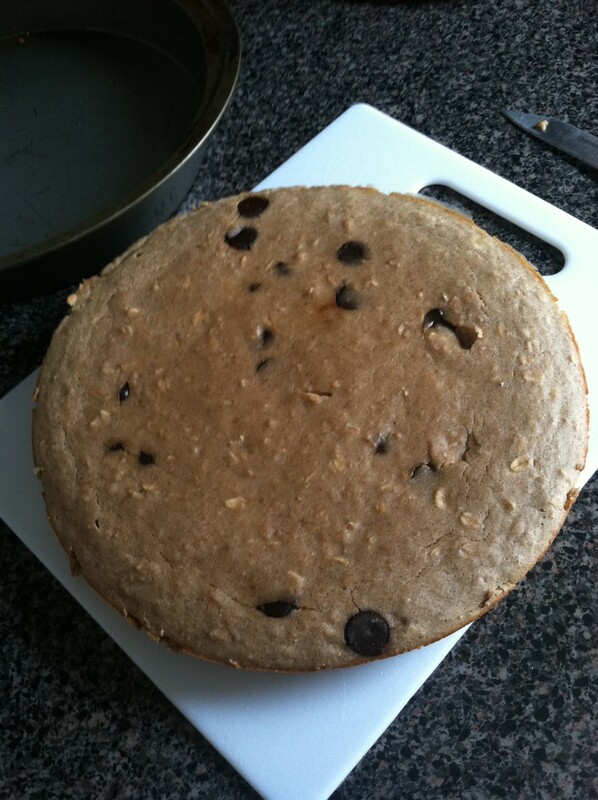 I placed it on a cutting board to let it cool more before proceeding to slice it! can you imagine the deliciousness? 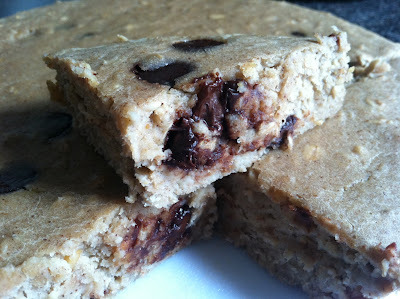 Enjoy one bar warm out of the oven (it made me feel like I was eating a cookie fresh out of the oven- seriously delicious, people) and store the rest in the fridge! I froze a few of mine as well. 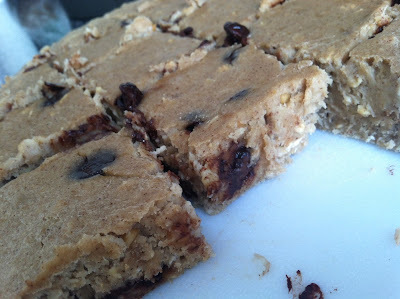 Since all of the ingredients are fresh, you want to enjoy them quicker than a store-bought product... those store-bought protein bars are filled with preservatives to allow them to last days, weeks, months, maybe years... EWWWW! 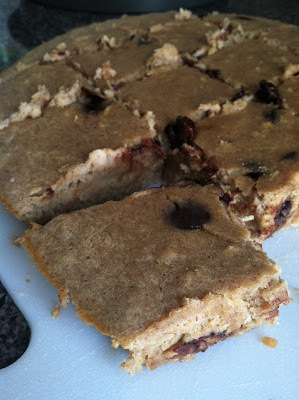 Not Morgan's Homemade Protein Bars! And let me tell you- I don't know how these will even stay in your fridge for more than a week. They are THAT good. Since they only take 20 MINUTES (with a 10 minute prep), you should have NO excuse that you "don't have time"- toss them in the oven when you watch the nightly news, when your dinner is cooking, while you're styling your hair... please, people. You have time! This will also save you money from the store-bought protein bars that can be $1/bar (or more)! And never forget: healthy is possible. Morgan, I love your blog! Keep it up! 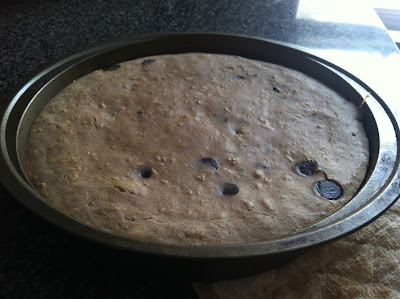 is it possible to substitute oat flour for another one? like whole wheat or all purpose? Oksana- thanks for reading my blog! Yes, you can substitute it I'm sure, although the oat flour is 'extra healthy!' I would suggest using whole wheat over the all-purpose flour has it has more nutritional value. Enjoy! I bought quest protein bars from an online store. I have used many protein bars before but none can beat quest. I just love the taste. Great home made protien bars. I am very much fond of them. Thanks a lot for posting such a great content. for buying home-made best fiber foods and nutrition bars, nuritatva is the best place to buy. 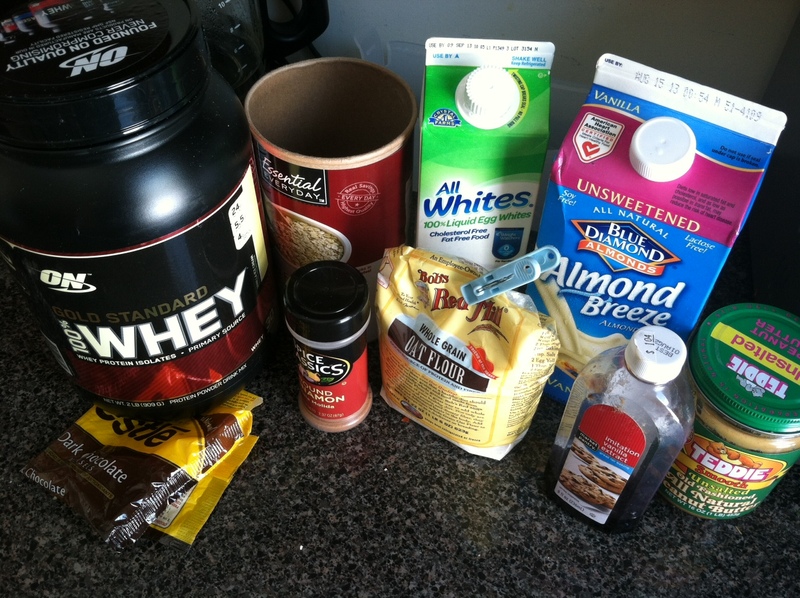 Great making of Chocolate Protein Bars. Looking very yummy. You must try nutrition bars from nutritatva to feel a new experience. Thanks for sharing the nice health related information. You can aslo check more about fibre rich indian food & their benefits. Thank for the sharing the nice health related informative content, It will be very helpful for health conscious people. Now you can also buy gluten free food from online store. Really an interesting and great blog posted by you.Would love to see your new blogs in upcoming days.Now you can also buy high fibre food from online store. Really an interesting and great blog posted by you.Would love to see your new blogs in upcoming days. Now you can also buy gluten free food from online store. Informative and very useful content, thanks for sharing this wonderful information. Would love to get more informative blogs from you.keep sharing, and Now you can also buy Indian superfoods from online store. Informative and very useful content, thanks for sharing this wonderful information. Would love to get more informative blogs from you.keep sharing, and You can aslo check more about fibre rich indian food & their benefits. This article is really amazing i have read it and it is containing all data further more greatly affects the new innovative ideas towards healthy foods. Now you can also buy gluten free food from online store. This article is really amazing i have read it and it is containing all data further more greatly affects the new innovative ideas towards healthy foods. Now you can also buy omega 3 food from online store.